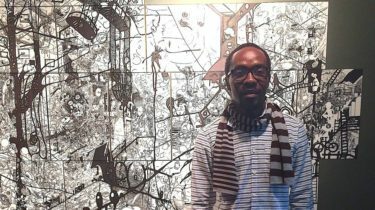 (Nairobi, May 1, 2018) – An internationally acclaimed cartoonist acquitted on trumped-up charges and released from prison on March 7, 2018, cannot leave Equatorial Guinea because authorities have stalled on renewing his passport, 9 human rights group said today. The charges against Ramón Esono Ebalé appear to have been in retaliation for cartoons that were critical of the government. An arbitrary or unreasonable delay in renewing Esono Ebalé’s passport violates his right to leave one’s own country, as enshrined in the Universal Declaration on Human Rights and multiple treaties to which Equatorial Guinea is a party. The government of Equatorial Guinea should expedite his passport so that he can be reunited with his wife and daughter. Esono Ebalé, who lives in El Salvador, was arrested on September 16, 2017, while visiting Equatorial Guinea to renew his passport. The police interrogated him at length about his drawings, but a news broadcast on a state-owned television channel a few days after the arrest claimed that police had found one million Central African francs (US$1,800) in a car Esono Ebalé was driving. He was formally charged with counterfeiting. The charge sheet alleged that a police officer, acting on a tip, had asked Esono Ebalé to exchange large bills and had received counterfeit notes in return. However, Esono Ebalé’s lawyer and another person who was at the February 27 trial, told the organizations that the state’s sole witness recanted this story, telling the court that his superiors had ordered him to charge Esono Ebalé with the crime. The court eventually acquitted Esono Ebalé. We, the undersigned freedom of expression and human rights organisations, strongly condemn last night’s guilty verdicts for staff and journalists of Cumhuriyet newspaper and note the harsh sentences for the defendants. The verdict further demonstrates that Turkey’s justice system and the rule of law is failing: this was a trial where the ‘crime’ was journalism and the only ‘evidence’ was journalistic activities. Several of our organisations have been present to monitor and record the proceedings since the first hearing in July 2017. The political nature of the trial was clear from the outset and continued throughout the trial. The initial indictment charged the defendants with a mixture of terrorism and employment related offenses. However, the evidence presented did not stand the test of proof beyond reasonable doubt of internationally recognizable crimes. The prosecution presented alleged changes to the editorial policy of the paper and the content of articles as ‘evidence’ of support for armed terrorist groups. Furthermore, despite 17 months of proceedings, no credible evidence was produced by the prosecution during the trial. The indictment, the pre-trial detention and the trial proceedings violated the human rights of the defendants, including the right to freedom of expression, the right to liberty and security and the right to a fair trial. Furthermore, the symbolic nature of this trial against Turkey’s most prominent opposition newspaper undoubtedly has a chilling effect on the right to free expression much more broadly in Turkey and restricts the rights of the population to access information and diverse views. “We observed violations of the right to a fair trial throughout the hearings. 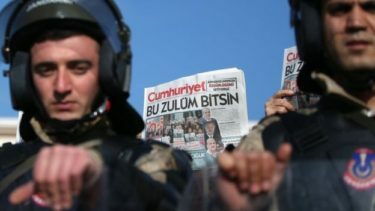 Despite the defence lawyers arguing that the basic requirements for a fair trial, such as an evidence-based indictment, were lacking these arbitrary sentences were handed down in order to attempt to intimidate one of the last remaining bastions of the independent press in Turkey,” said Turkey Advocacy Coordinator, Caroline Stockford. The defence team repeatedly relied on the rights enshrined in the Turkish Constitution, as well as the case law of the European Court of Human Rights, demonstrating the importance of European human rights law to Turkey’s domestic legal system. “‘Journalism is not a crime’ was declared again and again by the defendants and their lawyers and yet, despite the accusations containing no element of crime, the defendants served a collective total of 9.5 years in pretrial detention, and were found guilty at the end of an unfair trial,” said Jennifer Clement, President of PEN International. Speedy rulings on legal cases of Turkish journalists, which include the Cumhuriyet cases of Murat Sabuncu and others and staff writer Ahmet Şık cases, pending before the European Court of Human Rights (ECtHR) are crucial. This is not only to redress the rights violations of the many journalists still languishing in detention, but also to defend the independence and impartiality of the judiciary itself in Turkey. 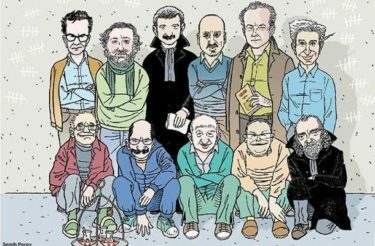 The Cumhuriyet case and other prominent trials against journalists clearly demonstrate that the rule of law is totally compromised in Turkey then there is little hope for fair or speedy domestic judicial recourse for any defendant. “The short three hours of deliberation by the judicial panel did not give the impression that the case was taken seriously. 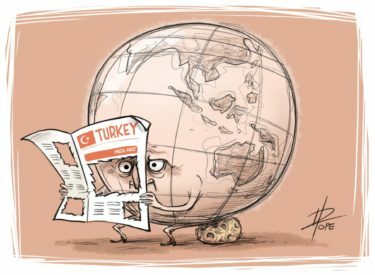 The 17 months during which there have been 7 hearings of this utterly groundless trial have damaged independent journalism in Turkey at a time when over 90% of the media is under the sway of the administration,” said Nora Wehofsits, Advocacy Officer, European Centre for Press and Media Freedom (ECPMF). In light of the apparent breakdown of the rule of law and the fact that Turkish courts are evidently unable to deliver justice, we also call on the ECtHR to fulfil its role as the ultimate guardian of human rights in Europe, and to rule swiftly on the free expression cases currently pending before it and provide an effective remedy for the severe human rights violations taking place in Turkey. We also call on the European and International media to continue to support their Turkish colleagues and to give space to dissenting voices who are repressed in Turkey. 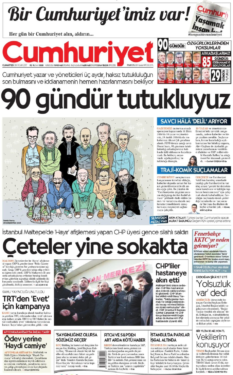 Cartoonists Rights Network International is shocked to learn that the judicial system in Turkey has levied what amounts to draconian prison sentences on the Cumhuriyet newspaper journalists who have been falsely accused of aiding and abetting a terrorist organization. Among those sentenced is our client, cartoonist Musa Kart, sentenced to 3 years 9 months, who, along with his colleagues, will remain free, but under court restrictions, pending appeal. Musa is the winner of the CRNI 2005 Award for Courage in Editorial Cartooning. He and the other journalists sentenced with him have been critics of Turkey’s leadership for more than ten years. The international human rights organizations monitoring the trial of these journalists all conclude that the charges against these journalists have been spurious and unfounded, and the judicial process a sham. We will report more on Musa’s situation as events unfold. We call on the government of Turkey to rescind all of these prison sentences, recognize its international obligations to free speech and a free press, and restore these journalists to their families. Musa Kart and 12 fellow employees of the independent Turkish newspaper Cumhuriyet have been sentenced to prison after being convicted on trumped up charges of aiding terrorist organizations. A Turkish court has sentenced 13 journalists to prison on terrorism charges, in a case that has sparked global outrage over press freedom. The journalists were employees of the opposition Cumhuriyet newspaper, which had taken a strong line against the Turkish government. Three of the journalists on trial were acquitted. Those convicted remain free while an appeal is pending. They were arrested during a crackdown after a failed coup in July 2016. 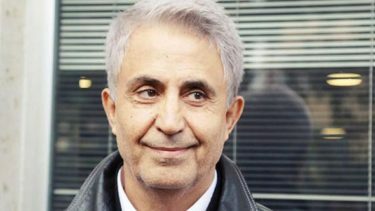 Turkish authorities have accused Cumhuriyet’s staff of supporting groups it has labelled terror organisations, including the Kurdistan Workers’ Party (PKK), ultra-left Revolutionary People’s Liberation Party-Front, and the cleric Fetullah Gulen, who Ankara accuses of masterminding the failed coup. Mr Gulen is living in self-imposed exile in the US, where authorities have refused to extradite him to Turkey. More than 50,000 people were arrested and 150,000 sacked or suspended from their jobs in the aftermath of the attempted coup, including journalists, police, military personnel, teachers and public servants. The 13 journalists and executives convicted on Wednesday include some of the country’s most prominent commentators, such as editor-in-chief Murat Sabuncu, cartoonist Musa Kart and columnist Kadri Gursel. The paper’s chairman, Akin Atalay was sentenced to seven years in prison, after already serving 500 days. Founded in 1924, Cumhuriyet had maintained fierce independence in an increasingly state-controlled media environment, drawing the ire of Turkey’s President, Recep Tayyip Erdogan. Mr Erdogan has been accused of cracking down on press freedom in the country. In March, 25 journalists were jailed for alleged links to Mr Gulen. This case caused outrage internationally, with human rights groups accusing the Turkish government of suppressing the media. The Committee to Protect Journalists (CPJ) condemned the convictions and called for all of those found guilty to be freed immediately. “Turkish authorities must stop equating journalism with terrorism, and release the scores of press workers jailed for doing their job,” CPJ Europe and Central Asia programme co-ordinator Nina Ognianova said in a statement in March. 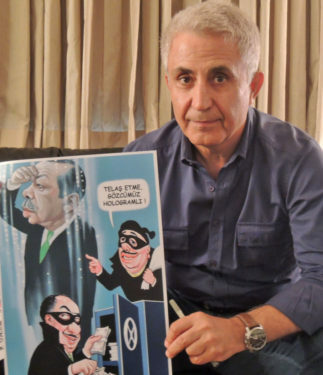 Renowned Turkish cartoonist Musa Kart was among the journalists from opposition newspaper Cumhuriyet put on trial over the last year by the Erdogan government. He and his coworkers at the paper, one of Turkey’s oldest independent newspapers, are facing charges of aiding terrorist organizations. Kart said the following at the close of the trial. (Nairobi, 7 de marzo de 2018) – Un tribunal de Guinea Ecuatorial puso en libertad, el 7 de marzo de 2018, a un artista que permaneció encarcelado casi seis meses bajo cargos dudosos, dijeron hoy 18 grupos de derechos humanos. La fiscalía desestimó todos los cargos contra Ramón Esono Ebalé, un caricaturista cuyo trabajo es a menudo crítico con el gobierno, en su juicio del 27 de febrero después de que el agente de policía que lo acusó de falsificar US$1.800 en moneda local admitió que la acusación se basaba en órdenes de sus superiores. “Es un gran alivio saber que la fiscalía ha retirado sus cargos contra Ramón, pero en realidad, nunca debieron haber sido presentados”, dijo Salil Tripathi, presidente del Comité de Escritores en Prisión de PEN International. “Instamos a las autoridades a garantizar el regreso seguro a su familia, permitirle continuar creando sus enérgicas ilustraciones y garantizar que Guinea Ecuatorial respete el derecho a la libertad de expresión”. La coalición global #FreeNseRamon, compuesta por cientos de artistas, activistas y organizaciones dedicadas a proteger la libertad artística, la libertad de expresión y otros derechos humanos, llevó a cabo una campaña para llamar la atención internacional sobre su situación. “La liberación de Ramón es un testimonio del poder del trabajo colectivo de decenas de organizaciones, cientos de artistas y ciudadanos preocupados”, señaló Tutu Alicante, director de EG Justice, que promueve los derechos humanos en Guinea Ecuatorial. “Pero no debemos olvidar que decenas de detractores del gobierno que no son tan afortunados llenan las cárceles de Guinea Ecuatorial, y que la lucha contra las violaciones de los derechos humanos y la impunidad debe continuar”. Esono Ebalé, que vive fuera de su Guinea Ecuatorial natal, fue arrestado el 16 de septiembre de 2017 mientras visitaba el país para solicitar un pasaporte nuevo. La policía lo interrogó sobre los diseños críticos con el gobierno, dijeron dos amigos españoles que fueron arrestados e interrogados junto a él y luego liberados. Pero un reportaje emitido en un canal de televisión estatal pocos días después del arresto afirmó que la policía había encontrado 1 millón de francos centroafricanos (francos CFA) en el automóvil que conducía Esono Ebalé. El 7 de diciembre, fue acusado formalmente de falsificación. Los cargos alegaban que un oficial de policía, que actuaba sobre la pista de una información anónima, le había pedido que intercambiara billetes grandes y que a cambio recibió billetes falsos. “El gobierno de Guinea Ecuatorial tiene un largo historial de acoso y persecución de sus detractores”, dijo Mausi Segun, director de África en Human Rights Watch. “La puesta en libertad de Ramón es una victoria importante contra la represión”. En el juicio celebrado el 27 de febrero en Malabo, capital de Guinea Ecuatorial, quedó claro que el agente de policía que había hecho las acusaciones no tenía conocimiento personal de la participación de Esono Ebalé en el presunto delito, según su abogado y otra persona presente en el juicio. Después de ofrecer detalles que contradecían la versión oficial, el agente admitió que había actuado por órdenes de sus superiores, señalaron estas fuentes. Acto seguido, la fiscalía retiró los cargos. “Estamos muy contentos de que Ramón haya sido absuelto y finalmente esté libre”, dijo Angela Quintal, coordinadora del programa de África en el Comité para la Protección de los Periodistas. “El hecho de que el testigo principal del Estado se haya retractado pone de relieve el hecho de que las autoridades inventaron los cargos en primer lugar. Ramón nunca debería haber pasado un solo día entre rejas y confiamos en que no será sometido a más represalias”. Los grupos de derechos humanos son Amnesty International, Arterial Network, Association of American Editorial Cartoonists, Asociación Profesional de Ilustradores de Madrid, Cartoonists Rights Network International, Cartooning for Peace, Committee to Protect Journalists, Caoilfhionn Gallagher QC, Jonathan Price and Paul Mason, Doughty Street Chambers, UK, EG Justice, FIDH, within the framework of the Observatory for the Protection of Human Rights Defenders, Freemuse, Human Rights Watch, Index on Censorship, PEN America, PEN International, Reporters without Borders, Swiss Foundation Cartooning for Peace, World Organisation Against Torture (OMCT), within the framework of the Observatory for the Protection of Human Rights Defenders. “Ahora que Ramón ha sido puesto en libertad, las autoridades deben iniciar una investigación exhaustiva y efectiva para determinar si los cargos en su contra fueron fabricados, y garantizar que el sistema de justicia penal no se utilice indebidamente para atacar y hostigar a los defensores de los derechos humanos”, dijo Marta Colomer, Activista de Amnistía Internacional sobre Guinea Ecuatorial.